A small protein named GILZ appears to protect against the bone loss that often accompanies arthritis and its treatment, researchers report. Arthritis, as well as aging, prompt the body to make more fat than bone, and the researchers have previously shown GILZ can restore a more youthful, healthy mix. 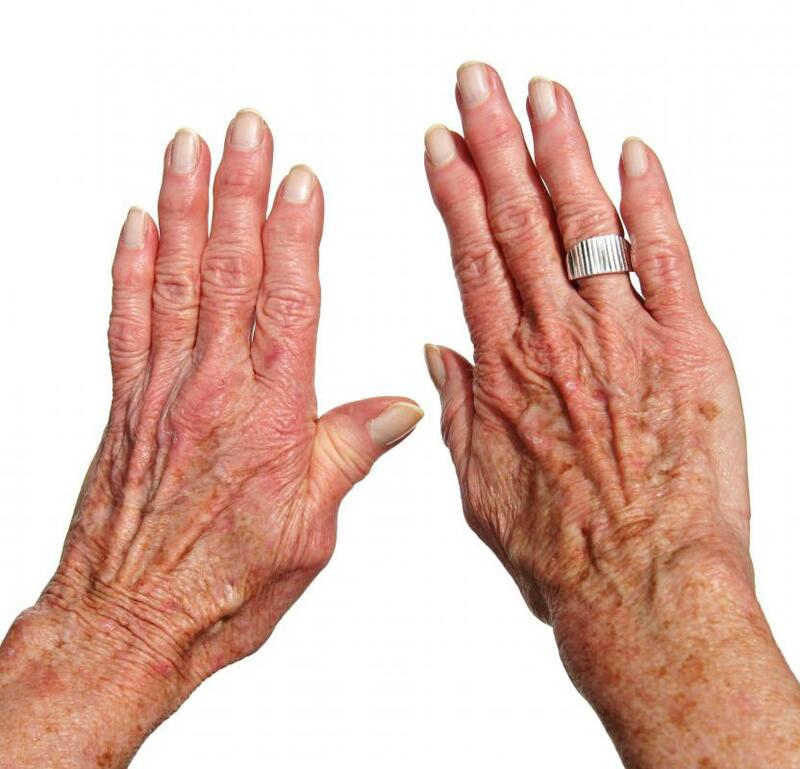 It also tamps down inflammation, a major factor in arthritis. Now they have early evidence that GILZ might one day be a better treatment option for arthritis patients than widely used synthetic glucocorticoids, which actually increase bone loss, said Dr. Xingming Shi, a bone biologist at the Medical College of Georgia (MCG) at Georgia Regents University. The research is being presented at The American Society for Bone and Mineral Research 2014 Annual Meeting September 12-15 in Houston. In addition to bone loss, glucocorticoids, such as prednisone, produce other side effects, including diabetes. While GILZ is induced by glucocorticoids, directly overexpressing the protein appears to better target sources of bone loss and inflammation and avoid these serious side effects. For this study, the focus was tumor necrosis factor alpha, a proinflammatory cytokine that helps regulate immune cells and is a major player in arthritis. Tumor necrosis factor alpha primarily works though promoting inflammation, which is great if the target is cancer. However, when tumor necrosis factor alpha becomes dysregulated, it can also cause diseases like arthritis and inflammatory bowel disease. To look specifically at the impact on bone loss, the researchers crossed mice bred to overexpress tumor necrosis factor alpha throughout the body with mice that overexpressed GILZ in just their mesenchymal stem cells. These stem cells produce the osteoblasts, which make bone. They also make fat, and when the cells stop making as much bone, they tend to make more of the fat. Dr.
Glaucoma, a leading cause of irreversible blindness, is associated with elevated pressure in the eye. This elevated pressure is essentially due to a plumbing problem. Fluid builds up in the eye, increasing pressure and eventually damaging the optic nerve. For nearly 150 years, researchers have been trying to understand what causes the blockage that prevents the eye from draining properly. In a unique study of human ocular cells, a multi-institution research team led by a biomedical engineer at Northwestern University has found a new culprit. 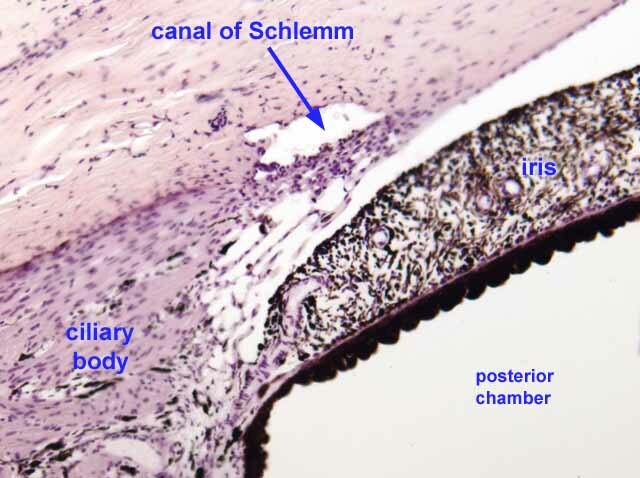 Glaucoma appears to be a consequence of mechanical dysfunction of endothelial cells -- a thin layer of cells that is the final barrier to fluid entering Schlemm’s canal (image), from which fluid then drains from the eye. The researchers found that these endothelial cells from eyes with glaucoma are stiffer than cells from healthy eyes. This stiffness limits the cells’ ability to deform and allow a fluid called aqueous humor to cross the endothelium and drain into Schlemm’s canal. This increased flow resistance is responsible for the elevated pressure associated with glaucoma. The findings were published online on September 8, 2014 in PNAS. “There is (presently) no cure for glaucoma, which affects more than two million Americans,” said Dr. Mark Johnson, the senior author of the study. “Our work shows that cells of this endothelial layer act as mechanical gates. Therapeutic strategies that alter the stiffness of these cells potentially could lead to a cure for this debilitating disease.” Dr. Johnson is a professor of biomedical engineering and mechanical engineering at Northwestern’s McCormick School of Engineering and Applied Science and a professor of ophthalmology at Northwestern University Feinberg School of Medicine. Physicians envision a future in which genomic data from patients is heavily used to manage care — but experts have questioned the accuracy and reliability of these analyses. Now, a study by 150 researchers in 12 countries finds real strength and agreement across RNA genomic sequencing techniques and laboratories — as well as ways to improve what little variability exists to set a new high standard. The results of the study were published in Nature Biotechnology in three separate research articles. These results should provide assurance to patients, clinicians and the research community that genomic sequencing is accurate, says E. Aubrey Thompson, Ph.D., a professor of cancer biology at the Mayo Clinic in Florida, one of three institutions that led the study. Dr. Thompson is a study co-author and member of the project leadership. "It seems very likely that decisions about patient care are going to be influenced by genomic data, derived from sequencing both RNA and DNA from patient samples, and we now know the extent to which these sequence-based analyses can be relied upon within a given laboratory or from laboratory to laboratory," he says. "That means that results of a patient's sample, from which clinical management decisions will likely be made, will be accurate worldwide," says Dr. Thompson. 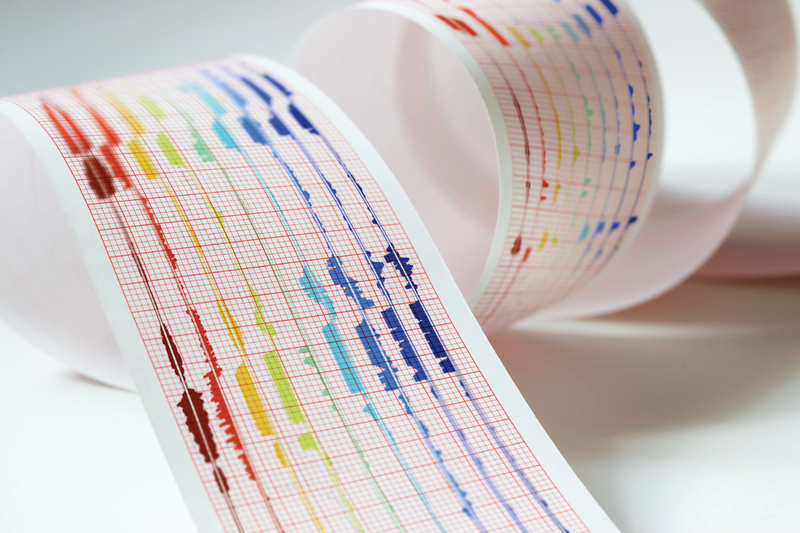 RNA sequencing is being used with increasing frequency to characterize a growing array of conditions — everything from prenatal birth defects to disorders of the elderly. The other institutions involved in the study are the Beijing Genomic Institute and Weill Cornell Medical School. All three institutions have extensive experience in sequencing RNA and have helped develop novel analytical tools for interpreting the data. The U.S. In a September 11, 2014 press release, Agilent Technologies Inc. (NYSE:A) announced on that it will introduce its latest innovation in ultra-high-performance liquid chromatography (UHPLC) on September 23, 2014 at AnalytiPLCca China, the international trade fair for laboratory technology, analysis, biotechnology, and diagnostics held in Shanghai. “We are pleased to introduce our newest UHPLC solution at this important scientific event,” said Stefan Schuette, vice president and general manager of Agilent’s Liquid Phase Separations Division. “This powerful new instrument will provide scientists with the superior quality and confidence they have come to expect from Agilent, combined with significant new features that will advance their work to the next level of achievement.” The instrument will be unveiled at Shanghai’s New International Expo Center, Hall N2, Booth 2102. Agilent management and scientists will be at the booth throughout the event to discuss product features and specifications with visitors. For more information about the upcoming launch, visit http://NextUHPLC.agilent.com, or join the social media conversation at #NextUHPLC. Agilent Technologies Inc. is a premier measurement company and a technology leader in chemical analysis, life sciences, diagnostics, electronics, and communications. The company’s 20,600 employees serve customers in more than 100 countries. Agilent had revenues of $6.8 billion in fiscal 2013. More information about Agilent is available at www.agilent.com. On Sept. 19, 2013, Agilent announced plans to separate into two publicly traded companies through a tax-free spinoff of its electronic measurement business. The new company is named Keysight Technologies, Inc. The separation is expected to be completed in early November 2014. In a September 2, 2014 press release, Agilent Technologies Inc. (NYSE:A) introduced the 7200B Quadrupole Time of Flight (Q-TOF) Gas Chromatography Mass Spectrometer (GC/MS) System. The system replaces the company’s most advanced GC/QTOF, the 7200A, with new capabilities that will significantly boost laboratory performance. “The Agilent 7200B Quadrupole Time of Flight GC/MS system offers reliability and confidence for the most challenging applications,” said Terry Sheehan, Agilent’s GC/MS marketing director. “Improved hardware performance, newly upgraded software features, and exact mass databases will provide immediate value for laboratories working in a variety of complex applications, such as food safety, environmental, designer drugs, doping, and metabolomics research.” The Agilent 7200B system provides improved mass accuracy specification of less than 3 ppm and an extended mass range, optimizing its capabilities for the most challenging problems. These performance enhancements will allow for the analysis of larger mass compounds and will be particularly beneficial when coupled to Thermal Separation Probes (TSP) or Direct Injection Probes (DIP). Other enhancements include Chemical Ionization Source and Backflush capabilities as standard on all GC/Q-TOF systems. This new high-performance instrumentation, combined with exact mass libraries and screening tools from Agilent’s MassHunter Workstation Software, provides scientists with a new level of confidence in library searching and a more efficient means to screen samples for both known and unknown compounds. For more information, visit: www.agilent.com/chem/GCMS_QTOF. Agilent Technologies Inc. is a leader in chemical analysis, life sciences, diagnostics, electronics, and communications. A team of Iranian researchers from the Rice Research Institute of Iran have discovered that Gynnodomorpha permixtana, a well-known moth species from Europe and Asia, has changed its host preferences in order to adjust to Iran's northern region environmental conditions. The importance of this adaptation for biological control of problematic weeds in rice fields and the biology of the moth on a new host plant have been described in the September 8, 2014 issue of the open-access journal Nota Lepidopterologica. The larvae of G. permixtana have so far been reported to feed on the seeds and flowers of plant species such as water-plantain, eyebright, lousewort, bitter root, and European yellow-rattle, which are weeds commonly present across Europe and Asia. A new study of the populations in northern Iran, however, has revealed a new host, Sagittaria trifolia, commonly known as “arrowhead.” This new discovery suggests that climatic and environmental conditions in northern regions of Iran resulted in the choice of a new host plant, and provides an exciting insight into how adaptation mechanisms work. Arrowheads are groups of problematic perennial broadleaf weeds that thrive in rice fields and waterways. Favorable climatic conditions after rice harvesting result in continued activity and thriving populations throughout the year. The economic importance of this weed has prompted researchers from the Rice Research Institute of Iran to seek possible solutions for the management of arrowhead. Their studies have revealed that the larvae of a certain moth species feeding on the fruits and seeds of the problematic weed, can lead to a dramatic decrease of its germination potential. After this discovery, the moth was sent for identification to Dr.